In this VETgirl online veterinary CE blog, we demonstrate how to intubate a dog with an upper airway obstruction. This is a life-threatening concern, and may be due to a laryngeal mass, foreign body in the oropharynx, swelling of the airway, or other associated causes. Successful management of the patient in respiratory distress due to an airway obstruction requires rapid assessment and correction of the anatomic abnormality to improve ventilation and oxygenation. In other words, establish an airway! In this particular case, a patient was rapidly assessed following a surgical biopsy of a malignant mass in the caudal pharynx. Although this dog initially recovered comfortable in the ICU oxygen cage, progressive respiratory stridor developed (as a result of oral cavity swelling) and resulted in an upper airway obstruction. Due to the massive airway swelling, intubation with a size-appropriate entotracheal tube (ETT) was not possible. As the patient was peri-arrest and critically unstable, the smallest ETT was used (2.5mm cuffed ETT). Following successful intubation, the patient remained hypercapneic despite manual ventilation, likely due to the very small diameter of the ETT. Due to the massive airway swelling and significant difficulty intubating with the 2.5fr ET tube, intubating with a more appropriate weight-sized endotracheal tube was a concern. Rather than the typical visual placement with a laryngoscope, the clinician used a guide wire to feed through the 2.5mm cuffed ETT. This is imilar to a modified Seldinger technique, which is often used when placing a central line catheter. In other words, the use of a guide wire was implemented. This wire was placed through the 2.5Fr ETT; after which, the small ETT was removed. 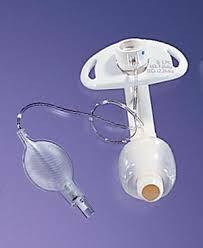 Then, the larger ETT was then placed over the wire, which was used as a guide. This allowed us to achieve successful intubation with a larger tube despite the airway swelling and lack of visualization of the airway. NOTE: As you can see in the video, the wire was backed out of the larger ETT as to not lose it accidentally down the trachea during the second intubation. Never let go of the wire during a modified Seldinger technique! It is also important to note that depending on the case, intubation with an ETT may not be possible and additional procedures such as a tracheostomy may be required. And while VETgirl is typically anti-steroids with trauma, someone give this dog some steroids stat! (e.g., dexamethasone 0.15 mg/kg IV q 12).